The holidays are upon us, and there’s nothing more fun than giving and spreading cheer to your loved ones! This year we decided to share some of our favorite things that would make excellent gifts, and we’ve got something for everyone (except kids because we don’t have any yet and haven’t quite mastered the art of kid gifts, but stay tuned for that in another year)! 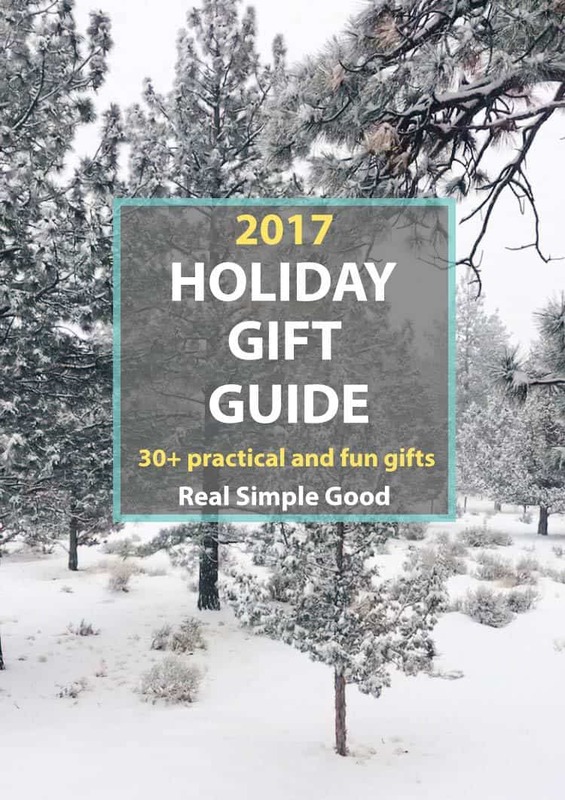 We’ve broken down our 2017 Holiday Gift Guide into several categories – For the Foodie, For Her, For Him and Stocking Stuffers! We also have special discount codes for some of our stocking stuffer ideas so be sure to check out the end of the post! Welp…let’s get right to it! Here is our 2017 Holiday Gift Guide! Many of the ideas are available on Amazon, which means you can get them in 48 hours with free shipping if you’re a Prime member. Oh and there’s one more gift idea – if you or someone you love isn’t already an Amazon Prime member – GIFT THAT! These are some of our most-used and appreciated kitchen gadgets, tools and cookbooks! We couldn’t create a 2017 Holiday Gift Guide without our beloved kitchen favorites. If you haven’t jumped on the Instant Pot train yet, this is the year! Get on it already and then also gift a cookbook like the one below for recipe inspiration to go with it! Click the links below the images. Vitamix Blender – At our house, this literally gets used every single day! Not even a joke. I blend my coffee or other warm beverage in the morning each and every day. Then, on top of that we use it for making sauces, marinades, whipped coconut cream, smoothies, banana nice cream, blender baking mixes, and the list goes on. I kind of wonder how I ever lived without one of these glorious kitchen machines. Cast Iron Skillet – We loovveee cooking with our cast iron skillet, and really it gets better and better over time the more you use it and it becomes well seasoned. It’s also an economical gift too. Take good care of a cast iron skillet and it will last you forever. Instant Pot – So here’s the deal…I passed on this one a couple of years ago and then it was ALL I thought about, so just do yourself the favor and get one this year! The Instant Pot is super versatile and you can seriously make such a wide variety of things in it – savory soups, pressure cooked meats, desserts, yogurt and so much more. 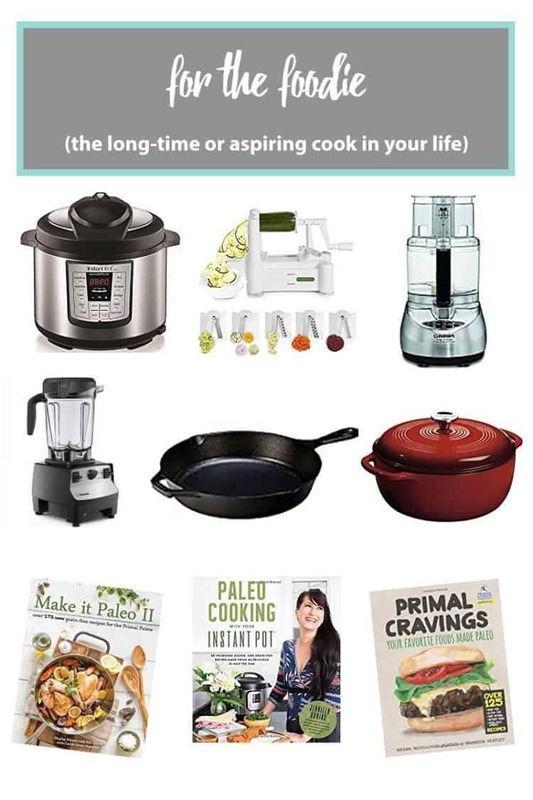 And….if you’re gifting an Instant Pot (or buying one for yourself) you might as well get the cookbook from Jennifer Robbins from Predominantly Paleo – Paleo Cooking with your Instant Pot – so you have plenty of recipe inspiration! These are just some of my favorite picks for rad girl gifts as part of our 2017 Holiday Gift Guide! Basically make your lady feel a little pampered, and then get her all the cozy things! Click the links below the images. 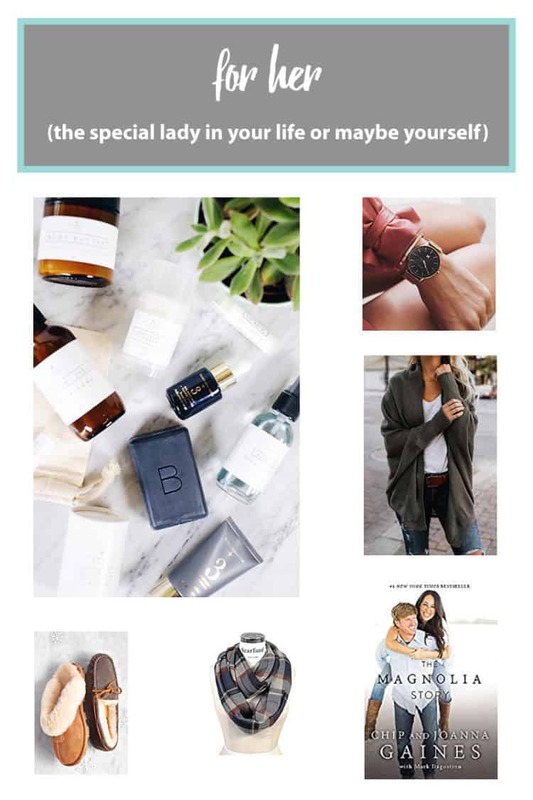 Non-toxic Beauty – Moving to safer, non-toxic beauty products is a must, especially when there are great options like Beautycounter and Primally Pure! They are my two favorite clean skincare brands and you can read more about some of my favorite products here and here, but the I will say the Charcoal Mask is a must! I’m happy to chat more about specifics as well. Just send me an email at beauty@realsimplegood.com. Plaid Scarf – They just make your outfit feel complete, are extra cozy and they are SUPER affordable! You can’t go wrong with one (or two) of these scarves! Cozy Cardigan – I love this one and it’s super cozy, but it does take a little while for the company to ship, so here’s another cozy option from Gap that’s a little more readily available! Go for something oversized and a soft material with a little texture. Ugg Slippers – I’ve had the open back pair for about a decade now! They are warm and have a real sole so you can get away with wearing them indoor and outdoor. Knowing that I’ve had mine for about ten years, I can attest to the quality and durability, which makes them worth the price! MVMT Watch – I have the biggest crush on this watch! Like for real though, it’s the perfect combo of simple and sophisticated. You can dress it up or down, and wear it with just about anything. These are ideas directly from the source! Justin hand-picked each of these gifts (and a couple of them I’ve gotten him in the past) for our 2017 Holiday Gift Guide! So, rest assured these are man approved and ready for gifting! Click the links below the images. Outdoor/Camping Gear – If your guy is an outdoorsy kind of guy like Justin, you will find lots of good ideas at this link. 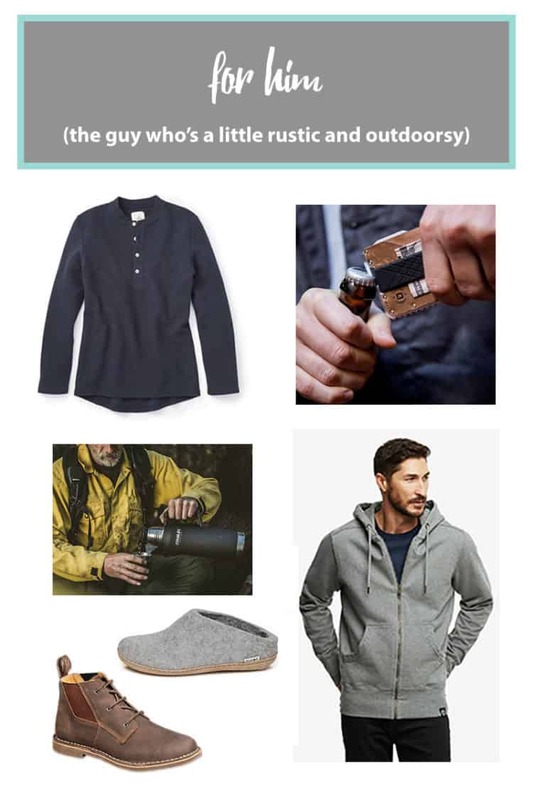 From camping gear, to the best mugs and all the gear in between there is something for every rustic kind of guy! Slim Multipurpose Wallet – Ok, Justin doesn’t have this one yet, but I have to agree with him that it looks pretty cool! All for multipurpose gadgets and this one looks super practical and handy! Glerup Slippers – These are a must if you live somewhere that gets chilly in the winters. We have tile floors that are soooo cold during the winter and these are Justin’s slipper of choice to beat the chilly temps! I don’t know about you guys, but the stocking stuffers have been my favorite part of Christmas for as long as I can remember! Something about the smaller, fun gifts is just the best! So, here are several ideas for filling up the stockings in our 2017 Holiday Gift Guide! And hopefully you aren’t surprised that there are lots more for your foodie friends! 😉 Click the links below the images. Mini Sized Body Butters – These are perfect for putting in your purse or storing at your desk! My favorite scents are lavender + eucalyptus and also the vanilla + almond scent. The lavender one is just so relaxing and the vanilla one smells like holiday baking! Copper Cup Turmeric Latte Mix – This is a great caffeine-free beverage! You just mix it into our favorite nut milk or coconut milk. You can add other things like more sweetener if you want that or you could add pumpkin pie spice and cinnamon. So many options! Four Sigmatic Mushroom Elixirs – There are lots of options, but essentially we should all add some mushrooms into our daily lives. They provide great adaptogenic support and are a superfood! My favorite elixirs are reishi and lion’s mane. When I’m traveling I like to pack a few packets and often add their instant coffee to my bag. Right now for Black Friday weekend you can get crazy good deals (up to 50% off), plus an extra 10% off with our discount code! Use discount code “rsg10” at checkout to save 10%!! Primally Pure Non-Toxic Deodorant – If you haven’t switched to a natural deodorant yet, it is time! Like for real. So many toxins are in regular deodorant and antiperspirant. You can read plenty more about my journey to find a natural deodorant that works here, but I can tell you with conviction to jump straight to Primally Pure! Both Justin and I use it as well as most of the rest of my family and countless friends. Jem Organics Mini Nut Butter Jars – You will never find another tasty, creamy and decadent nut butter quite like these! Holy moly! They are the tastiest and most indulgent things, and…those cute little mini jars! Perfect for stuffing in a stocking! Right now you can hop on over to their website and enjoy 30% off (no code needed)!! You won’t go back to regular old nut butters after you try these! Stoneware Mug – I love mugs! I could probably collect mugs and succulents for the rest of my life. Back on track though, I love these cute mugs from the Hearth and Hand collection by Chip and Joanna Gaines at Target! Travel mugs are great options too! Grass-Fed Beef Sticks – A healthy, easy to pack snack for when you are on-the-go! These are great and have the added benefit of probiotics in them, too! You can read more about the makers of these beef sticks and why we love them here. Skip straight to shopping and use the discount code “realsimplegood” at checkout to save 30% site wide!!! Shop here! 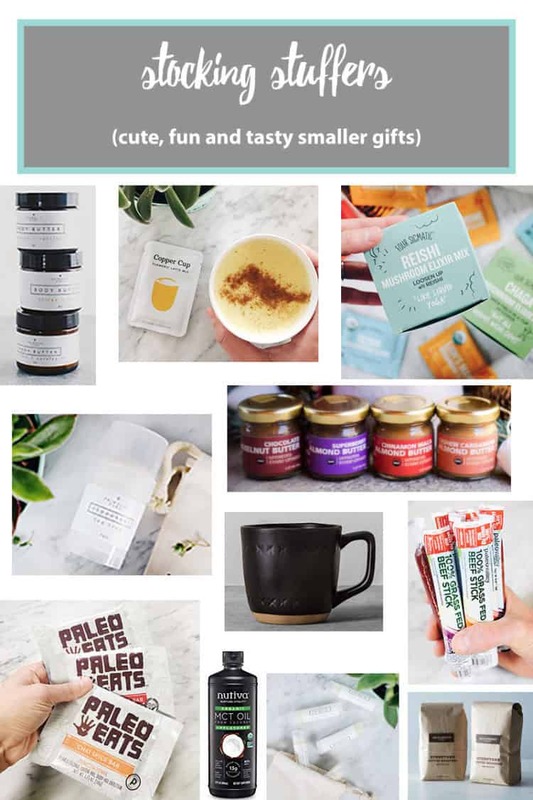 Paleo Eats Bars – Our friend Debbie, the creator of these tasty bars, has nailed it when it comes to primally inspired bars. The Chai Spice Bar is my FAVORITE! A lot of bars end up upsetting my stomach, so I was so happy when I tried these out and they didn’t upset my stomach at all and also weren’t too sweet. Use the discount code “RSGHOLIDAY2017” at checkout to save 25%!!! Seriously, such a great deal for these high quality bars! MCT Oil – I add this to my morning beverage every single day for a little extra brain fuel! It also helps to make your caffeine slower burning, which is great! We love Nutiva because they focus on sustainably sourced products that are organic too! Lip Balm – Another thing I can’t live without is lip balm. I have always been a chapstick girl, and Justin even uses this lip balm now too! We both love how soft our lips feel, which is pretty perfect timing for kissing under the mistletoe! 😉 While I’m a die-hard Primally Pure fan, I’ve recently been introduced to two other local brands that are promising as well! First is a long-time friend from Portland who finally opened up an etsy shop – By Jess Anderson. She’s got several flavor combos you will love! Another friend here in Bend – Aimee from Bushel and a Peck – creates high quality lip balms as well. Check them out! Specialty Coffee – I ALWAYS add a bag of yummy specialty coffee to Justin’s stocking. Get a bag of the good stuff – you know what I mean, the stuff you love but can’t justify spending your hard-earned dollars on the regular for. We love Stumptown coffee made locally in Portland, Oregon! Welp…that’s it my friends! This is our 2017 Holiday Gift Guide. We hope you’ve found some inspired and fun, yet practical gift ideas to spread the holiday cheer to your loved ones (and maybe add a little cheer to your own life too)!